Diablo III Eternal Collection is the latest big AAA third-party title to get the Switch treatment and the first Blizzard game to come to a Nintendo system since the days of the SNES believe it or not. Sure this may be a six-year old game but Diablo III Eternal Collection has aged tremendously well and better yet feels like it’s found a perfect home in the Nintendo Switch largely thanks to its portable features. If you’re new to the plague-infested world of Diablo III, it’s essentially a top-down dungeon crawler with a focus on gaining experience and gathering increasingly better armour and weapons. Before you kick off your adventure you’ll need to first choose your class of which there are seven. It’s your usual line-up each with their weaknesses and strengths. Barbarians and Crusaders, for example, are your more melee focused members ideal for getting stuck in the thick of a battle while Demon Hunters and Wizards specialise in ranged attacks ideal for supporting your team from afar. While you’ll need to start from scratch every time you create a new character, there’s definitely merit in doing so if just to try out their varying play styles. The game’s campaign mode is split into five acts, each full with quests and missions that will see you travel to a variety of locations. The story itself might be fairly forgettable but does its best to add some context behind what is essentially a series of battlefields to explore and swarms of enemies to kill. As you progress you’ll be levelling up your character as well as improving your gear and powers. 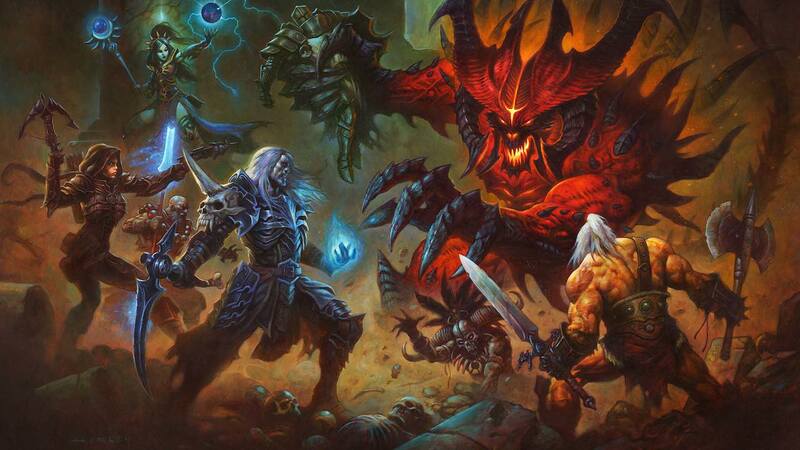 This is where Diablo III’s biggest draw is, its sense of character progression. No matter what you are doing in the game you always feel like you’re being rewarded constantly even if it’s some extra cash or just a helmet that adds an extra point of defence to your stats. Even in the early goings, your character will learn new attacks and abilities at a brisk pace. Take my wizard, for example, only capable of throwing magic projectiles initially but quickly expanding that arsenal to frost rays and explosions. These attacks can be switched for newly learned ones too and beyond that each can attach runes that offer further enhancements. Similarly, armour, items and weapons litter the game either dropped by enemies or found in chests and its here I found myself hooked, comparing stats and trying to improve my gear with as many upward facing green arrows as possible. Using your weapons, magic or abilities is simple thanks to the game’s slim lined approach to combat. Easy to pick up but also requiring a certain level of resource management. You see while basic attacks can be used as often as you like, some abilities either have cool downs or require arcane power. Knowing when best to use certain attacks and keeping an eye on your level of arcane can be the difference between life and another death. Once you’ve finished the game’s main campaign, adventure mode has plenty more to offer allowing players to then select any act and complete random bounties for more money and better gear. Complete five in one area and you’ll earn more bonuses. Nephalem Rifts highlight these quests each one a randomly generated dungeon area that require you to kill a certain number of enemies. Again meet the quota and you’ll be awash with rewards. While the campaign may act as a great place to start for newcomers, adventure will suit those after something tougher. In fact, if you want to ignore the game’s campaign altogether and jump straight into adventure you can. I had a great time playing through Diablo III Eternal Collection on my own, be it in the game’s campaign or adventure mode. Played in a group, however, is where the game truly excels whether you play online or locally. The latter in particular worked a treat since we were able to all communicate and assign everyone a task. One of us may have been responsible for healing the team for example while another slowing the bigger and more dangerous enemies in their tracks with spells. If everyone can bring a copy of the game to the party then you’ll all be able to play wirelessly on your own Switch. Everyone on the same console works just fine too but comes with a small price, namely accessing your inventory and skills. Since you’re all sharing the same screen, if one player wants to change a piece of armour then the game will be paused for everyone as they filter through the menu. Quick-equipping can limit this problem but chances are you’ll each want to go into more detail in the main inventory screen at some point. Annoying sure but worth it just for that more traditional multiplayer experience with everyone huddled around the TV. All in all, the Switch version looks and runs great whether you’re playing in docked or handheld mode. While games like Doom or Wolfenstein: The New Colossus have seen obvious graphic compromises for the Switch version, here they’re barely noticeable if at all. One might argue that with the added bonus of being able to play anywhere this could well be the best way to play. In fact, I spent most of my playtime for this review in handheld. Of course, shrinking the action down the Switch’s smaller screen can make it a little tough to make out on occasion with the text in menus a little hard to make out. It’s a minor niggle though in an otherwise well-presented game overall.